This presentation was delivered as a webinar to members of the World Association of Disaster and Emergency Medicine. During a mass-gathering, some participants may receive health care for injuries or illnesses that occur during the event. In-event first responders provide initial assessment and management in-event. However, when further definitive care is required, municipal ambulance services provide additional assessment, treatment and transport of participants to acute care settings, such as hospitals. 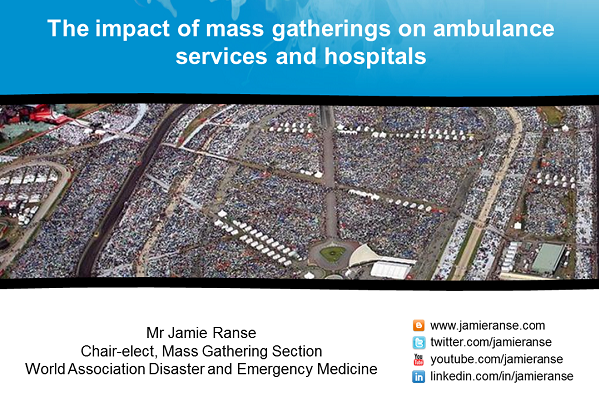 The impact on both ambulance services and hospitals from mass-gathering events is the focus of this presentation. In particular, a case study of one outdoor music festival in 2012 in the Australian Capital Territory with approximately 20,000 participants will be analysed. This festival had one first aid post and a health team staffed by doctors, nurses and paramedics.